The impact of FIFA's decision to ban Barcelona Star, Lionel Messi appears to be worsening Argentina's chances of qualifying for the 2018 World Cup. 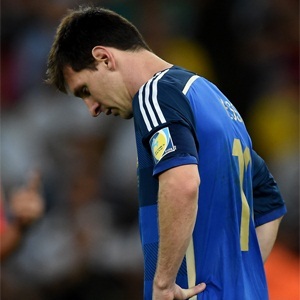 Argentina national team is on the brink of not qualifying for the 2018 World Cup in Russia. The team was without their 'brain box' and captain as they crashed to a 2-0 defeat on Tuesday by Bolivia in South America World Cup qualifiers. Goals from Juan Carlos Arce and Marcelo Martins secured a deserved win for Bolivia, who retain a slender hope of qualification for next year’s finals despite remaining second from bottom of the table. Argentina was rocked just hours before kick-off after reports emerged that Messi had been hit with a four-match ban following a ruling from disciplinary chiefs at world governing body FIFA in Zurich. The Barcelona superstar was stunned after being suspended for four of Argentina’s five remaining World Cup qualification matches after being caught swearing at an official in a game against Chile last week. Messi’s suspension left Argentina coach, Edgardo Bauza forced to make a hasty reshuffle to his starting line-up, bringing in Atletico Madrid’s Angel Correa in attack while leaving Manchester City’s Sergio Aguero on the bench.